This calculator will help you make a decision between two credit card offers. First enter a sample balance amount for the comparison and a monthly payment that is greater than the monthly interest charge. From there, fill in the fields where necessary. Under both the columns for Card #1 and Card #2, input the following information: annual fee, introductory annual interest rate, the term of that introductory rate, and the regular interest rate. Then from the pull-down menus provided, choose either “daily” or “monthly” as the compounding periods. Press CALCULATE, and you’ll learn the number of payments it will take to pay off the balance on both cards, and you’ll see the total costs associated with the balance on the two cards. Hopefully, this can lead you to the best card for your wallet. If a card has no introductory offer, leave the introductory fields blank for that card (rather than entering a zero in both fields). It seems every week there's a new, shiny credit card offer in the mail. From free airline miles, to cash back, to credit towards vacation and free gas, how do you tell the difference between a great value and a scam? While there is no blanket perfect card for everyone, there is the perfect card that best suits your needs. 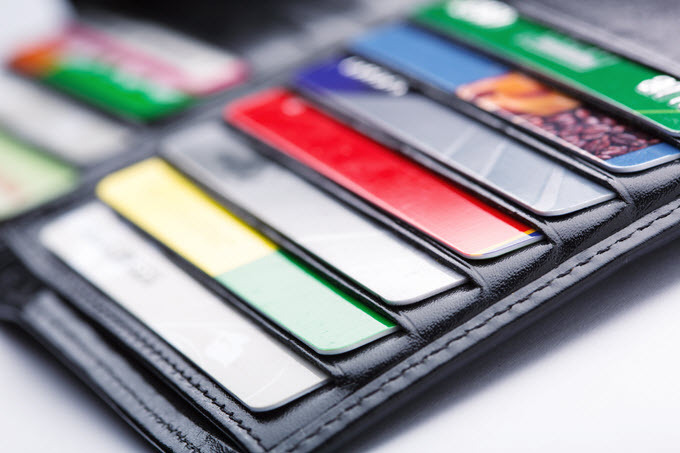 There are three components that go into making a good decision on your next credit card. The details of the credit program, the rewards, and your spending habits create the ideal card for you. Since you can't select "cafeteria style" what best suits your needs based on credit, rewards, and spending habits, you must look at the offerings in each group and choose the best all-around based on your needs. The first step in selection is thinking about spending habits. How much do I charge every month? Do I carry a balance? All the time or just occasionally and then it's paid off? What types of charges do I make most? How often do I charge? Drawing a realistic picture of your spending habits will help you pick out a card that best suits your needs. The amount you charge every month is important. Some credit card companies offer amazing perks to high spending customers. If you fall into that group, you could be rewarded for your expenditures, but if not, you might pay a higher yearly fee. Some cards also offer rewards if you spend a certain dollar amount within the first six months of the account being open. If you don't intend to spend that amount, the card may not be worth it. For credit card customers who consistently carry a balance, it's better to look for low-interest rates than miles or other perks. The discounts you receive from the card won't prove worth the extra dollars you spend on the interest and fees for carrying a balance. Knowing the types of charges you make most often is important when looking at the different benefits of the cards. Most rewards cards offer benefits on the dollars spent in a particular category. For instance, a card may give you two percent cash back on all gas and grocery expenses and one percent on all restaurants. If you never charge groceries or gas, this is obviously not the right card for you. Pair up your spending with card benefits for maximum reward. Credit card companies advertise a lot of deals as an incentive to draw in new customers. However, many of the rates you see and the best offers require a minimum credit score. If you don't qualify for that score, your interest rates will be higher. Also, must credit card companies reserve the right to increase your interest rate should you miss a payment or should your credit score plummet, even if you keep making your payment to them on time. Many of the companies tightened up their policies and penalties during the recession. If you have multiple cards, you're probably dividing your spending among them, which means you may not be eligible for the spending minimums that will give you the best benefits. While this is sometimes a good idea -- like when you place your gas spending on the card that gives you the most benefit for doing so, and your travel expenses on the card that rewards those at the highest level -- it takes a good memory to manage which card offers the best deal on which type of expense. If you don't travel often, or don't spend your time at a particular type of hotel or on a single airline, travel cards will not benefit you. Be honest about the type of traveling you do, how you get there, and where you stay. Being brand loyal pays from a rewards standpoint but if you're a bargain traveler, going with the best deal, not the same brand, a loyalty card won't be your best bet. Now that you know a little more about your spending habits, it's important to discuss the particulars of cards and what makes them different. Read the fine print on your card offer to find out if the card you're considering has an annual fee. If it does, and many of the high paying benefit cards do, do a quick calculation of how much you would need to see as a return for it to be worth it. Some cards will waive the fee for the first year so if you're unsure of whether the fee will cover the benefit, you can try it for a year and cancel if it doesn't. Many credit card companies have cards with and without fees, so if you find a company you want to do business with but don't want to pay an annual fee, ask a member of their customer service team what options they can offer. As mentioned above, credit card companies will raise your rates if the minimum due is not paid each month. A good deal on an APR or introductory rate can be negated instantly with one late bill. Make sure you know the company's policy on late payments and its effect on rate increases before applying for the card. In addition to the rate, it's important to understand how the company calculates the interest charged on late payments since it can make a significant difference. You will pay less if you select a company that bases the balance computation method on an average daily balance and not on the balance of two billing cycles. Sign-up bonuses are wonderful if you can meet whatever spending level required and the card (after the bonus) fits your spending habits. While hidden fees aren't entirely hidden -- they're always in the small print -- many credit card customers don't take the time to read them. If you're considering a new card, acquaint yourself with these charges if you want to avoid overpaying. When you've been approved for a card, you'll be given a credit limit. This is an amount of credit the company is willing to extend you. Many credit card companies will continue to raise the limits for card owners with good credit who pay on time. This is a benefit that can help your credit score, as long as you're not using a large percentage of the increase. Credit score companies factor in your utilization rate, which is the percentage of your open credit in use. They do this for each card as well as the total for all of your cards. The ideal utilization rate is 20 percent (or lower). For instance, if you had a $3,000 limit on your card, keeping your balance at (or under) $600 would help increase your credit score. It shows lenders you have been extended to a higher line of credit but show the restraint not to use it. Identity theft and credit card fraud are major concerns for credit card holders and the companies that extend them the credit. Many companies are starting to embed chips in their cards to fight identity theft and fraud. The U.K. is already using chip and PIN cards, but the U.S. has been slow to adopt them. The new cards are not compatible with current card readers. The new cards employ pins instead of signatures, so even if someone stole the number of the card, she would need the pin to complete the transaction. The cost to switch to a new system so far is prohibitive, but this is something that might show on the horizon for the United States. You should consider this in choosing a card if you travel a great deal in Europe, as some U.S. cards will no longer work there. Travel rewards cards are cards that offer direct seats on a particular airline. These cards are ideal for brand loyal, frequent travelers with frequent flyer accounts. Key point of these cards is that they not only lock you into traveling on a specific airline, but they also employ blackout dates (times in which you cannot travel) and offer only a limited number of seats. You must book early if you're using miles. Another problem consumers have met recently is the number of changes companies offering frequent flyer programs have instituted. Companies like United and Southwest are now basing rewards on ticket cost, not on distance. If you get a great deal on a ticket, you'll earn less as a frequent flyer. Keep this in mind when you are considering a travel reward card. Some travel cards pay rewards as credits against travel. This means you pay for your ticket first and get credited on your bill, a nice perk that helps avoid blackout dates and provides more flexibility. There are a number of cash back reward cards that give you a portion of your spending back. Look for cards with high total percentages or high rewards in the area you spend most. A few of these cards don't give direct cash rewards back but rather add them to an investment vehicle for you. Understand how the reward is paid before choosing one. These reward cards are similar to the cash back but offer rewards with a specific company or category pay out, such as earning free gas or merchandise. As with all rewards cards, the interest rates are higher, so they are best for people who do not often carry a balance. Also, reward levels change so make sure you understand what you're getting and there's more about the card you like than simply the reward agreement. Now that you have a better understanding of yourself as a credit card user, and the kinds of cards and rewards on the market, don't apply for every card that looks good. Several credit card applications in a small period of time could make your FICO score drop slightly when multiple inquiries appear. If you get a pre-approved credit card offer, you can still be denied. These companies only have a broad idea of what your score is on the credit card spectrum. When you apply and they check your real credit score, you might get rejected. Doing your research can help you find the best offer. You don't have to wait for it to find you. Read the reviews and compare numbers. While finding the perfect credit card for you means being honest about who you are and what you need now, it's also important to review your needs periodically, as they change with lifestyle and debt level. Don't forget to check your card benefits quarterly. Lenders have the right to make changes to these as well.